Anne Schröder is Professor of English Linguistics at Bielefeld University, Germany. She studied English and French at the universities of Caen, France, Bristol, UK and Freiburg i. 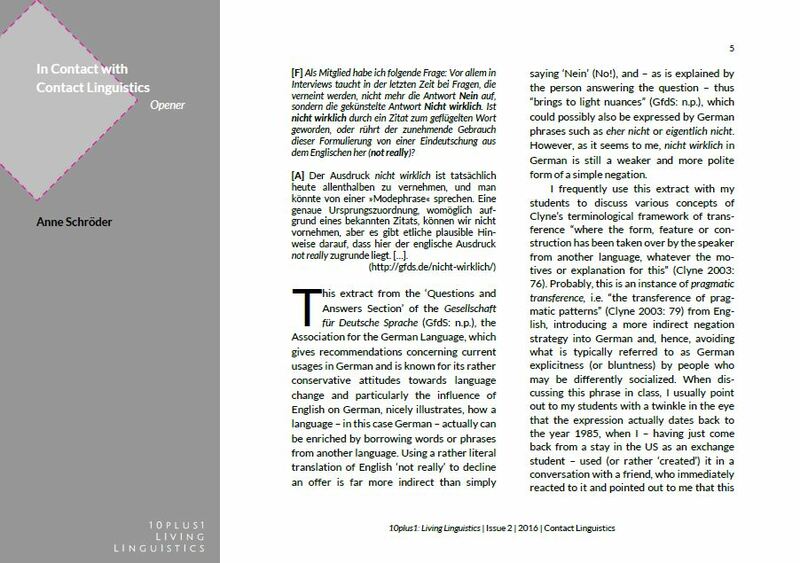 Br., Germany, where she received her PhD in English Linguistics. She previously worked at Martin Luther University Halle-Wittenberg and at Chemnitz University of Technology, Germany. Her publications include Status, Functions, and Prospects of Pidgin English. An Empirical Approach to Language Dynamics in Cameroon (2003), On the Productivity of Verbal Prefixation in English. Synchronic and Diachronic Perspectives (2011), the edition of Crossing Borders. Interdisciplinary Approaches to Africa (2004), Codification, Canons, and Curricula. Description and Prescription in Language and Literature (2012), and a number of articles on similar topics. Most recently, her research interests also include various aspects of the dynamics of English in Namibia.